New tank truck for hauling and pumping water at fires. This is the new tanker-pumper truck, placed in service in December of 2001. We try to keep our trucks as multi-purpose trucks so this truck is a vacuum tanker. It uses suction and pressure to fill and unload the water. Be sure you scroll down the page to see all the pictures. Here's the truck the way it arrived from the factory the first time. It was sent back to have several items fixed or added that were left out. We try to keep our trucks as multi-purpose trucks so this truck is a vacuum tanker. It uses suction and pressure to fill and unload the water. Here you can see the hydraulic valve that switches from vacuum to pressure. This valve is controlled by the driver via remote control. Here you see the pump panel. This would be used when this truck is pumping water instead of dumping it into a porta tank. This could happen if this was the only truck on the scene, if it was a long way from access on the road to the pumper at the fire, or where the truck is used to draft from a river or pond and then must pump a distance to fill other trucks. Since this is a new truck, every operator must go through training on the truck and be certified to operate this vehicle before they're allowed to use the truck at a fire scene. One of the features we put on this truck is the ability to "pump-and-go". This allows the truck to operate while at the same time running the fire pump. It's useful when using the truck to assist in ditch or field fires, or when you need to move the truck out of fire danger but don't want to cut the water from the attack lines. 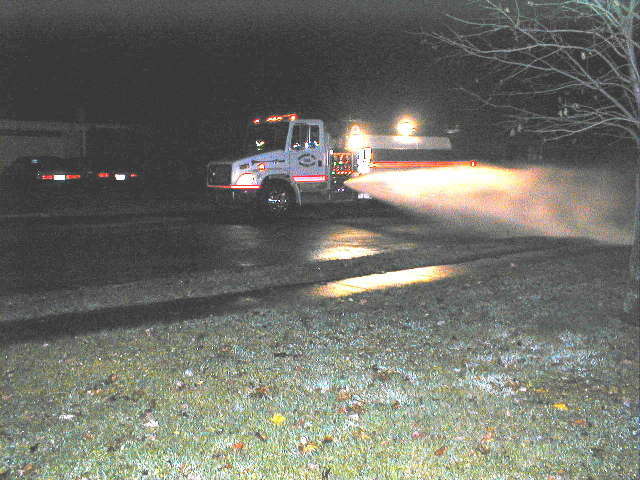 It's possible to get an excellent load of water put onto the fire while the truck remains on solid ground. The view from the passenger seat. The silver box in the center controls the vacuum for the tank. 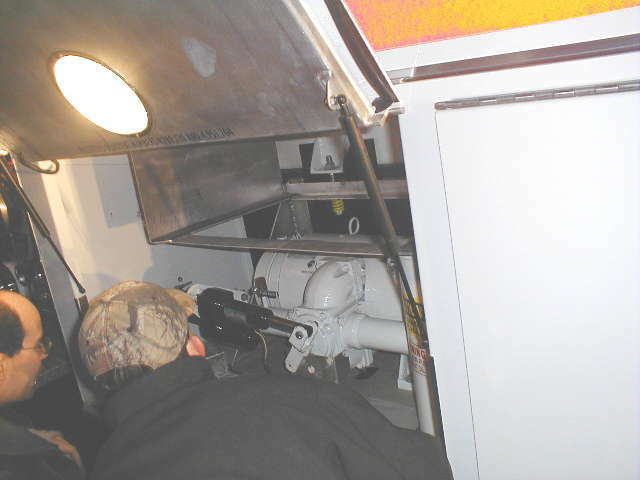 The large gage on the dash lets the operator see what level of vacuum, or pressure is on the tank. The blue box on the side of the silver box is where the operator's radio headset plugs in. These headsets insure that the operator is able to hear all radio traffic over the sound of the truck and sirens. 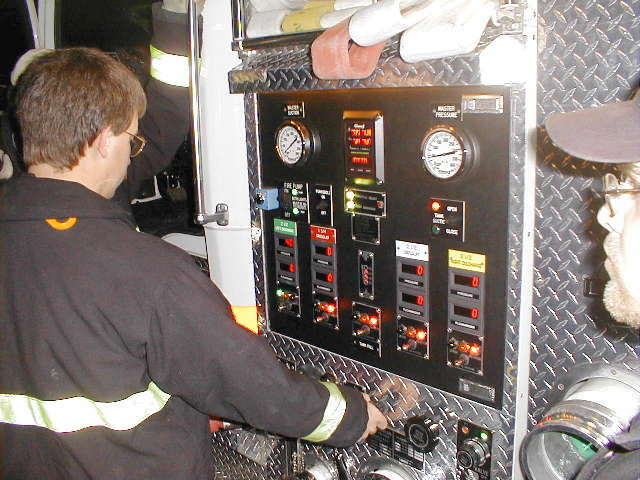 This close-up of the control panel shows how simple this truck is to operate. All the valves are controlled electronically with simple toggle switches.